Perfect for pro and hobbyist woodworkers, cabinet makers, metal crafters, mechanics, reloaders and workshop DIYs. The AccuMASTER’S precision ground measuring faces will give you precise, reliable outside, inside, depth and step measurements. Its hardened stainless steel ruler and jaws are designed to measure up to your workshop demands. EASY TO SEE AND USE! – Extra large LCD display featuring the largest sized main digits (over 5/8"" tall) drastically improves visibility and usability in shop environments. No more small dial faces or hard to read Vernier scales. PRACTICAL 1/64"" FRACTIONS - most woodworkers want precision and they want it in the familiar format of inches and fractions, but they also need it to be in a usable format -- it's not helpful to see 53/128"" if your tools (and your eyes) only read to 64ths! AccuMASTER solves this and also gives you decimal inches and millimeters if the job requires. SMOOTH AND EASY OPERATION - unlike many in this price range, the AccuMASTER glides smoothly along the stainless steel ruler as the slip-resistant thumb roller allows precise stops for the most accurate measurements. The clamp screw lets you lock the slider at any position desired. The Mode key toggles between Inch-Fractions, Decimal Inch and MMs. The ""alternate-zero"" lets you reset to zero at any point for relative measurements. On/Off button and auto-shut-off ensures long battery life. SPECIFICATIONS – Accuracy 0.001"" (0.02mm); LCD Display Resolution 0.0005"" (0.01mm) 1/64"". Range 0-6"". Comes with CR-2032 battery, sturdy foam-lined case and a 1-year Warranty. BONUS BATTERY – spare CR-2032 battery included for added value! Plus, the secure easy access battery door stays firmly closed, will not slide or pop off like on others reviewed here. 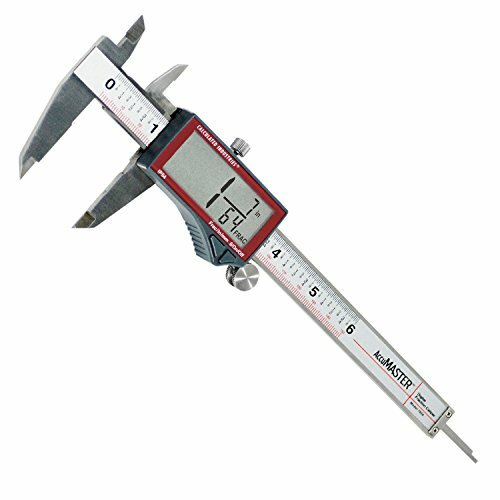 Why put up with less-featured, hard to read digital calipers in your shop?